We know from our years of experience as bridal salon professionals that each woman’s hair and skin is unique. The right technique must be applied in order to make each bride as beautiful as she can be. This is especially true for ethnic skin tones and hair types. Many destination brides of different ethnicities worry local salons will not have the knowledge to style their hair or make their skin look its best for their wedding day. 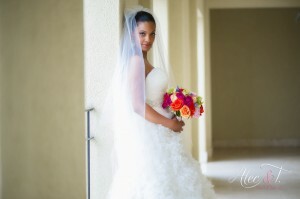 We’d like to reassure our clients that we work with bridal parties from all over the world and of varying ethnicities. We love helping intelligent, strong women look and feel their best for their dream wedding, so when Dr. Jackie K. contacted us to do her wedding hair and make-up, we were thrilled to be part of her prep team. Jackie is gorgeous even without any make-up, so we really tried to let her natural beauty shine through using just enough make-up to highlight her features. 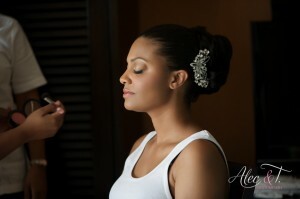 Her hair was styled in a sleek, large bun that looked perfect with her bridal veil. Lashes are a must for any bride, so of course we applied Jackie’s lashes and did a natural shade of taupe on her lids to accent the fullness of the lashes. We also did hair and make-up for Jackie’s two bridesmaids, her mother, and the groom’s mother. The bridesmaids were given pretty up-dos and vivid make-up with a bright lip to go with their teal gowns. 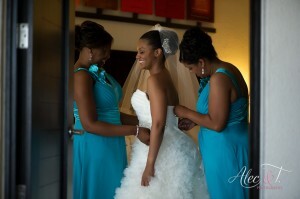 The mothers of the bride and groom were styled to look their best for their families and friends. All photos we post are of actual clients we have personally styled. Suzanne personally supervises the training of all of her hair and make-up artists, so we guarantee your hair and make-up will be perfect–even if Suzanne is not on-site. Jackie’s hair and make-up was done at Casa Dorada by our team of Suzanne Morel Face and Body Care professionals. Her wedding venue was Sunset da Mona Lisa. 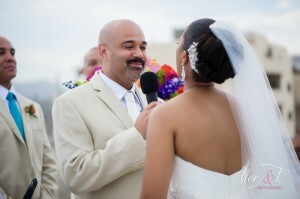 This entry was posted in Blog and tagged African American wedding Cabo, Be Tha Bride Events Wedding planner, Los Cabos wedding, Wedding Casa Dorada, Wedding hair and make-up Cabo, Wedding Sunset Da Monalisa.